Race online against friends or random opponents. Win races to earn XP and increase your skill level. Level up to unlock cars and addons. Twelve levels set in desert, arctic, forest and jungle sceneries. Customize your ride in the garage. Compete for the top spot in the leaderboards. 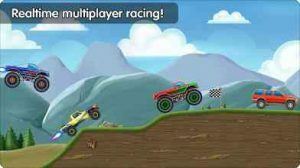 Invite your friends to play a multiplayer race. Great game and I’ve logged soooo many hours over the past few years, but the game JUST recently started giving me a frame rate of like 25/second. It’s not UNPLAYABLE, just annoying. It’s weird, seeing how the game hasn’t updated in a year. Yet to determine the source of the issue.